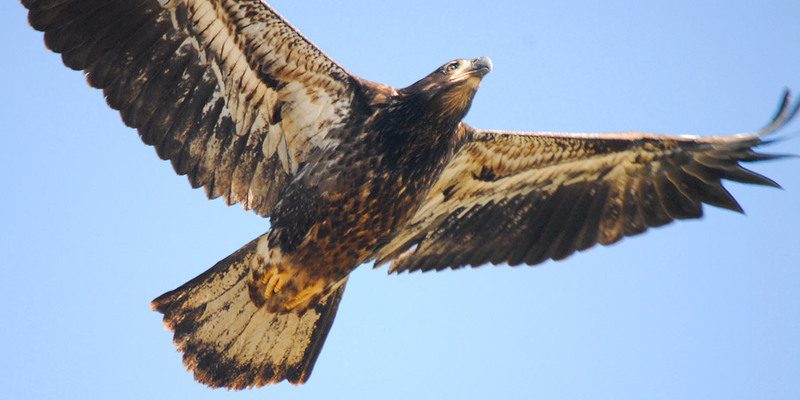 The easiest raptor to find around here is the Bald Eagle. Nanoose Bay isn't Brackendale, but you have to be blind-folded not to see at least one every day. 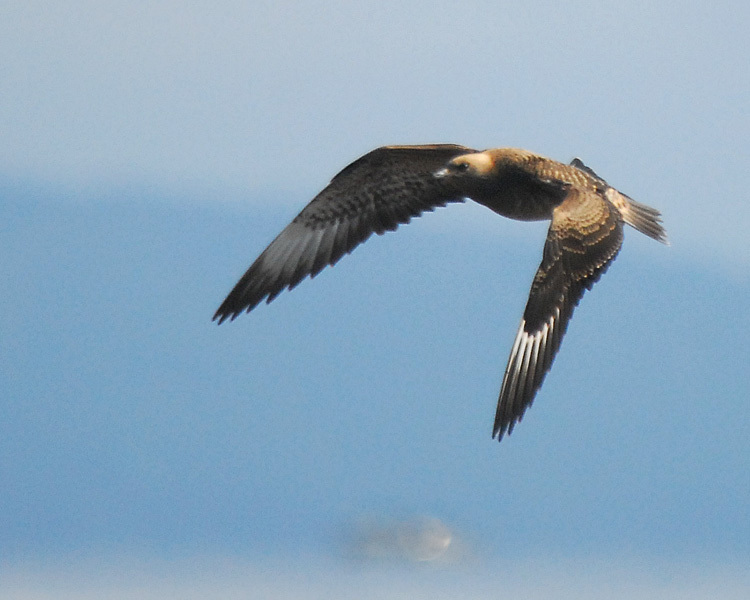 There are a number of nests around so there are quite a few recently fledged juveniles lounging around. 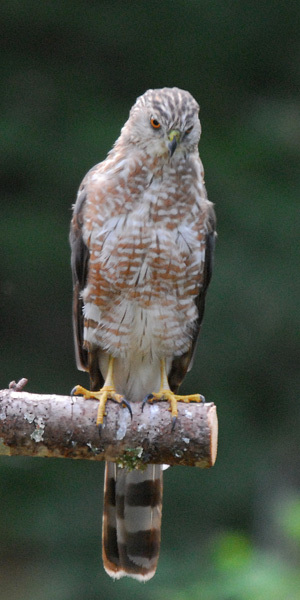 The Cooper's Hawk is not that common, but a local one checks my feeders periodically. I took this shot through a closed window before sunrise so I'm surprised it even turned out. 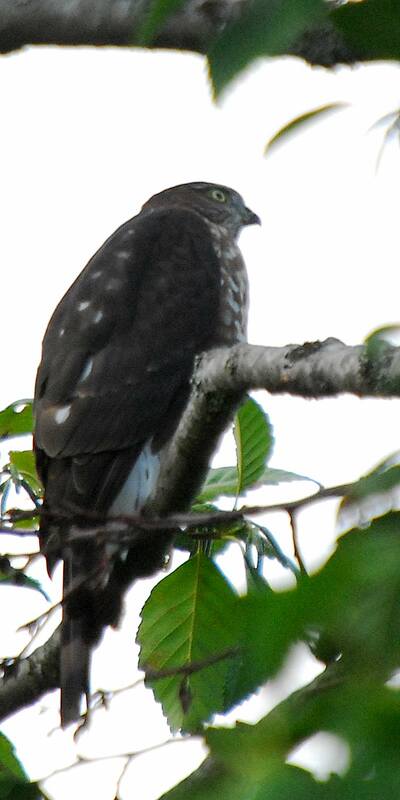 For newcomers to birding, notice the rounded tail. That's a sure sign it is a Cooper's and not a Sharp-shinned. I still haven't got a close-up of the Peregrine, but it certainly has a close-up of me. 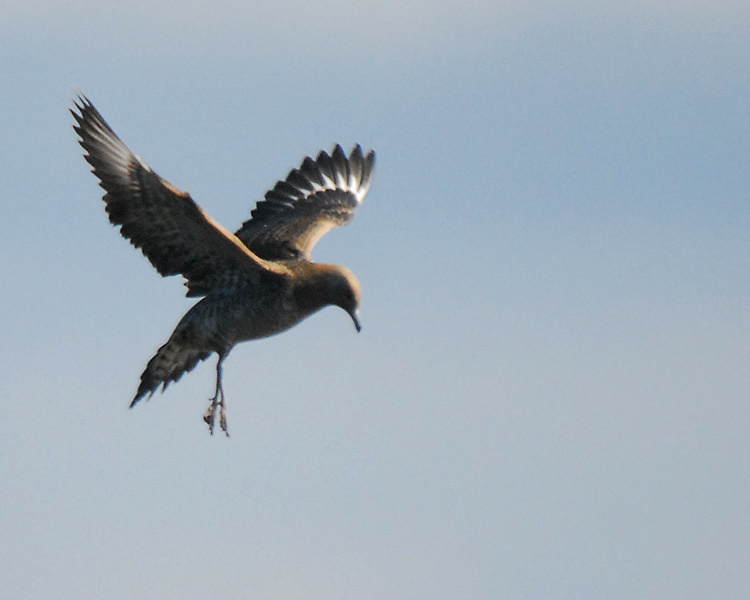 I was photgraphing shorebirds at Holden when it dive-bombed the shorebirds about 3 meters from me. I felt the wind as it zoomed by empty-clawed. 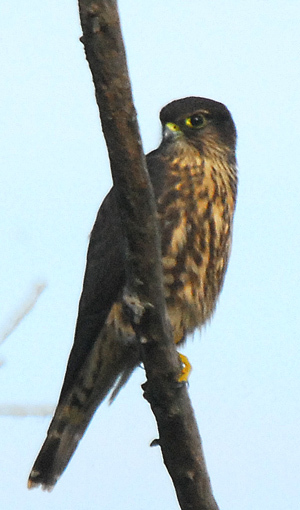 If it isn't the Peregrine, it's the Merlin that's harassing the shorebirds at Holden. 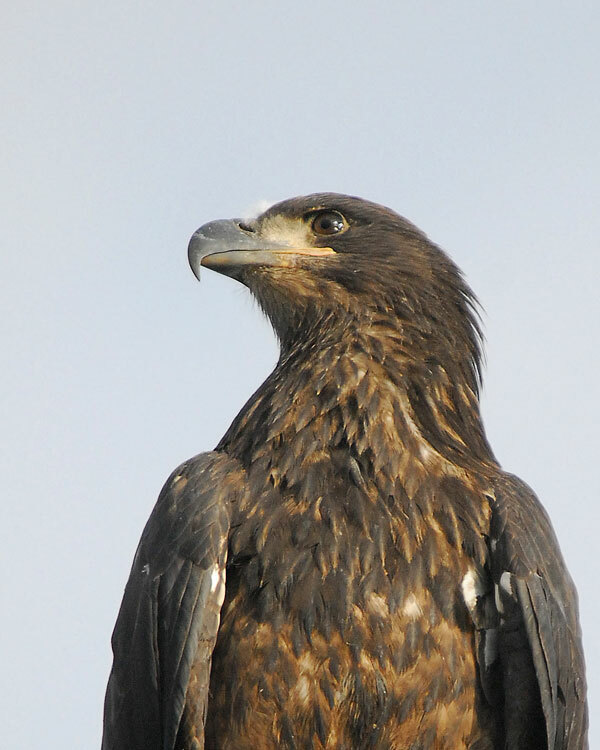 Remeber those juvenile eagles I mentioned? Here's one of them at French Creck. 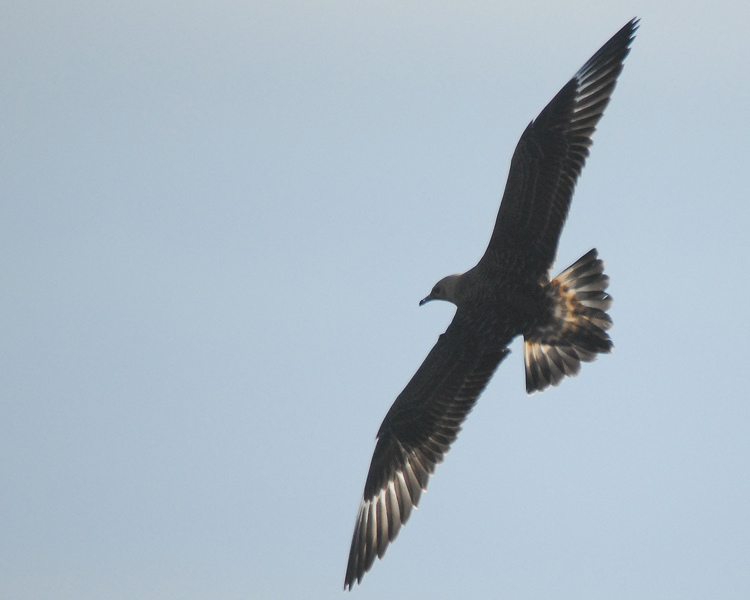 It was perched on the mast of a fishing boat. Ospreys have been a regular feature at Buttertubs this year. During the soring they showed a lot of interest in the Osprey platform. maybe next year. Finally, a Sharp-shinned. 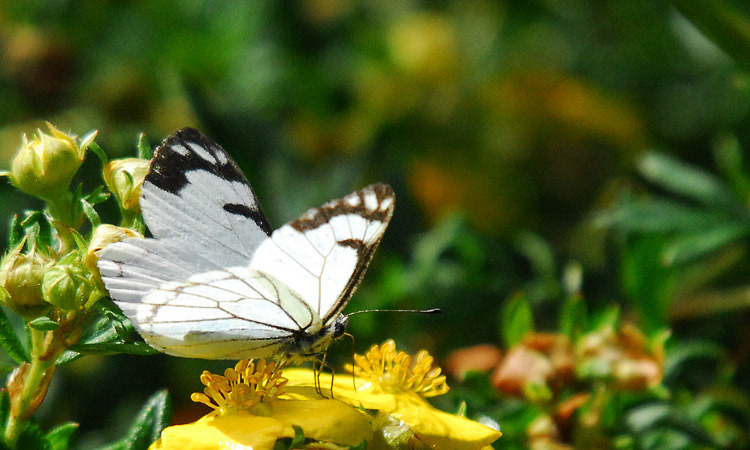 They have been scarce since spring. In fact we got two for the price of one at Buttertubs where a pair was playing tag. The last thing I wanted see when I pulled up to Holden was a Peregine Falcon, and a host of shorebirds making an exit to the east. 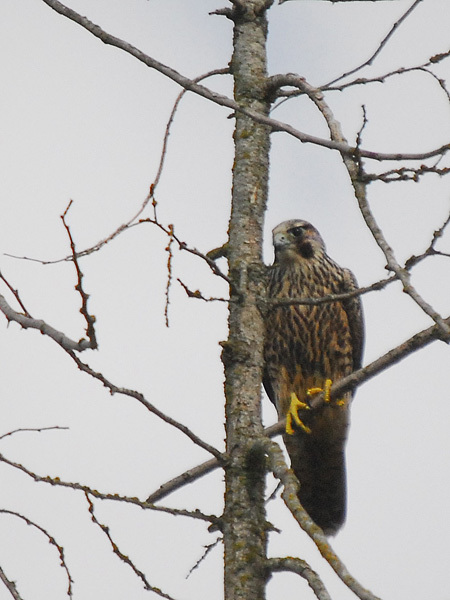 I don't know if the Peregrine got it's shorebird fix, but I suspect it didn't as it proceeded to harass and chase a Northern Flicker. It also kept a small group of shorebirds on the move as I made my futile effort at a couple of Pectoral and Semipalmated Sandpipers. 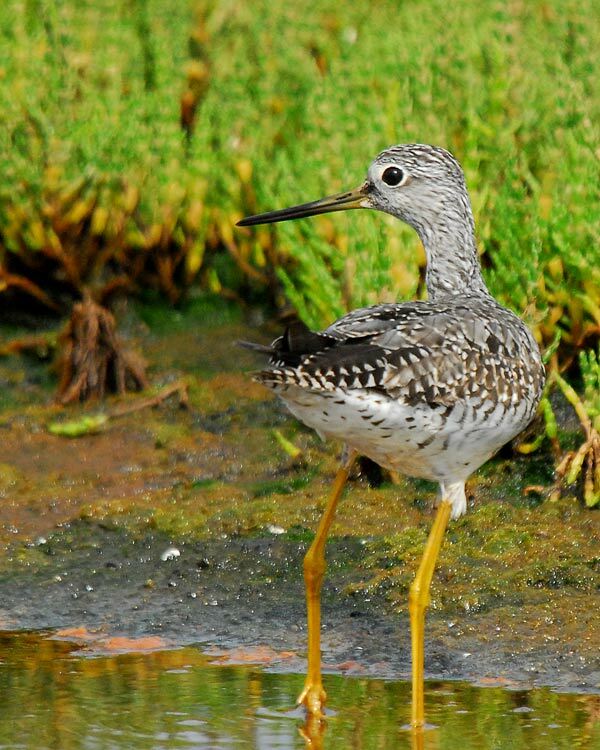 The only bird that stayed around was a very trusting Greater Yellowlegs. 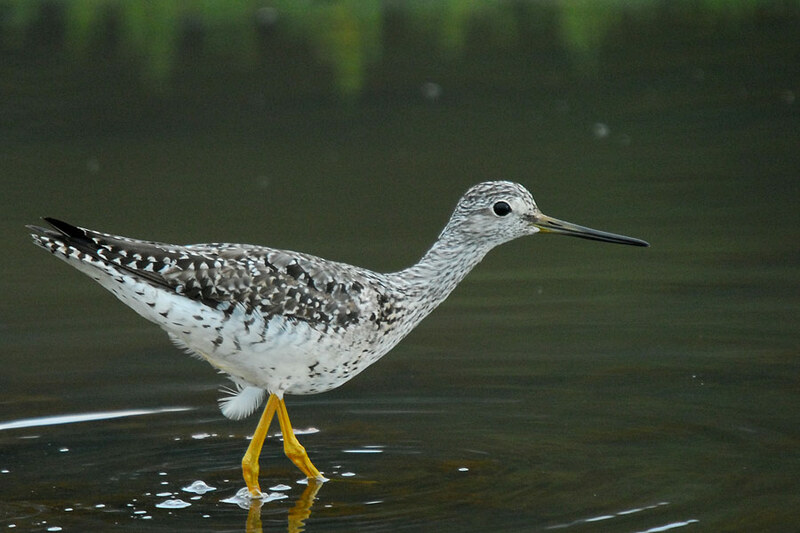 Yellowlegs was stirring the water with one foot then picking up some of the dislodged goosies. I'm not sure why yellowlegs stayed behind after the Peregrine scattered the small flock. Perhaps, it felt safe close to me. 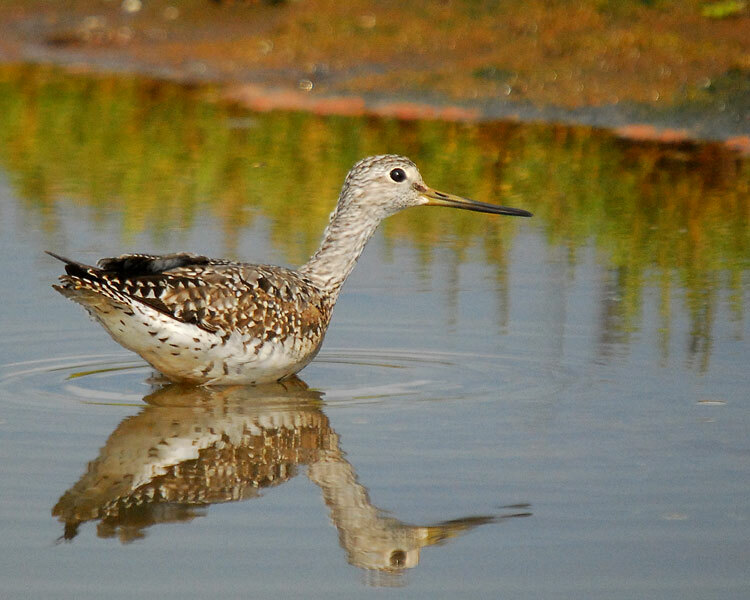 I'm happy to say that Yellowlegs was still merrily stirring the red mud as I left. The only other bird I managed to photograph was the Long-billed Dowitcher. It felt sorry for me so gave me the two-for-one deal. Admiral Tryon's Lagoon is not even a lagoon. It's just a small bay at the western end of Columbia Beach. It's dry when the tide is out, but at mid tide it looks like a lagoon as its outer edge is enclosed by a sandbar. At high tide the sandbar is submerged and the lagoon disappears. Despite being flanked by a subdivision, it is still an interesting birding location. The sandbar is a popular roosting spot for gulls, shorebirds, and other avian visitors like terns and ducks. 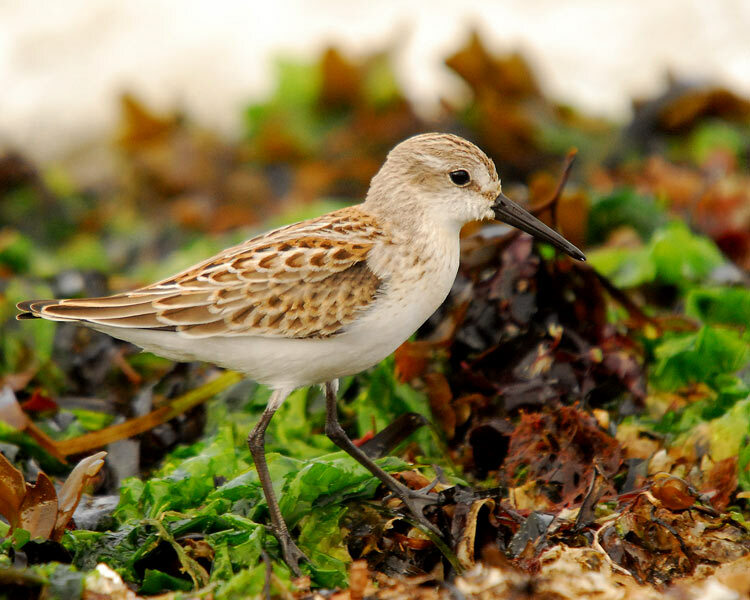 Admiral's is at it's best during late summer and early fall when the winter shorebirds return and passing migrants stop to rest and replenish fat reserves. Deja-vu. 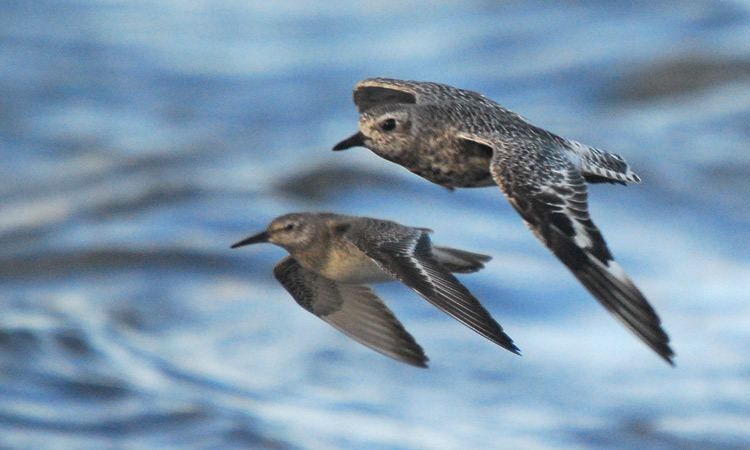 Didn't I just post Western Sandpipers recently? That's ok. What you see is what I get. 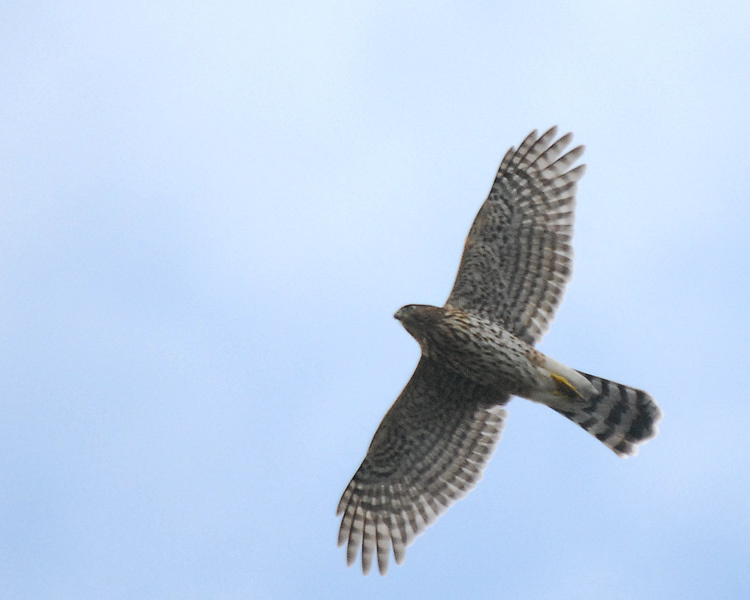 I certainly don't mind seeing the same bird many times over. In fact, I'm partial to Westerns at Admiral's as I can recall many pleasant evenings enjoying their company as they foraged and then snoozed at high tide. 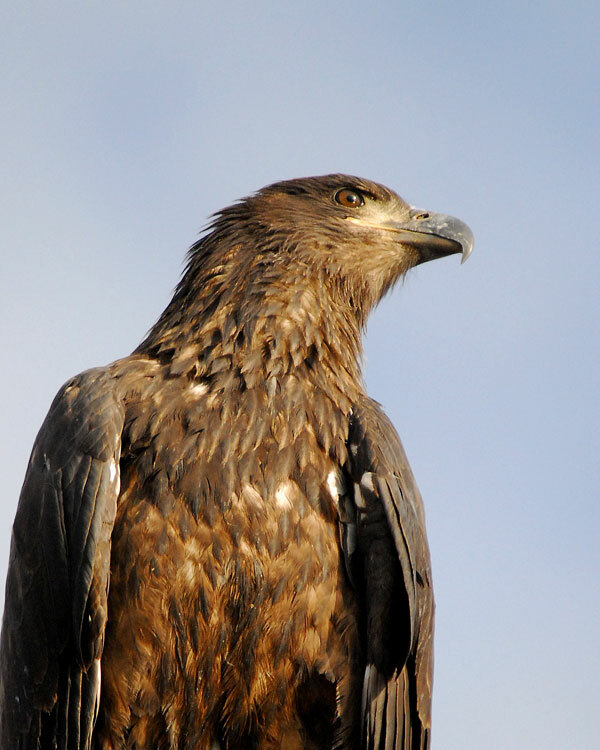 There are many subtle variations in plumage and structure with Westerns. How's this for a good diagnostic shot. Shows all the significant features including the webbed feet. A Pale Western - This bird really stood out from the other Westerns in the flock. I believe it is a Western, but it was orange and not rufous like the others. 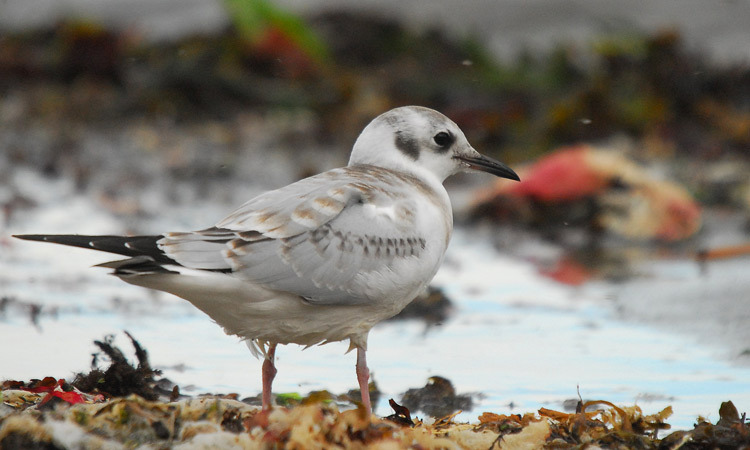 It also has very pale legs, and a fairly short bill. 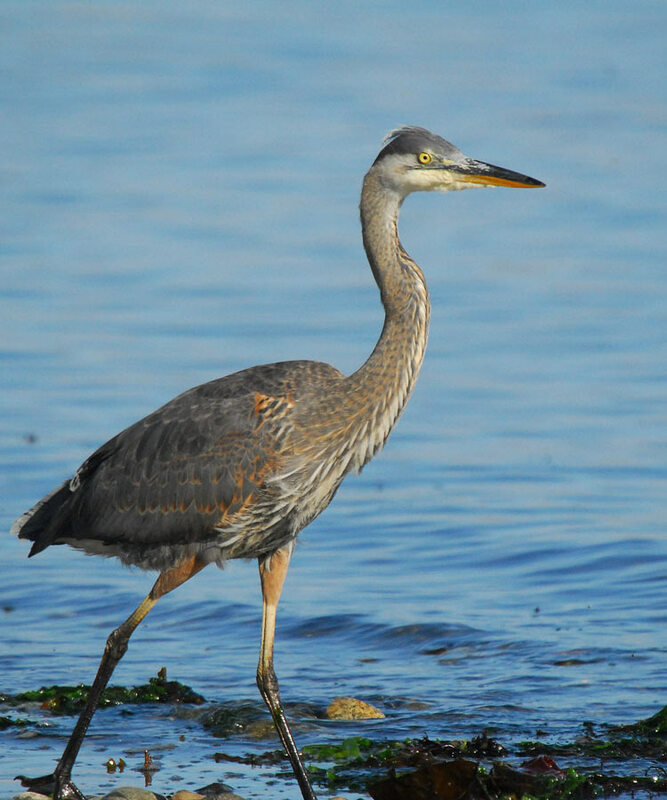 The Great Blue Heron is a regular as the shallow pools provide some easy foraging. I've never seen any large flocks of peeps at Admiral's, but there seems to be a regular flow of small groups. 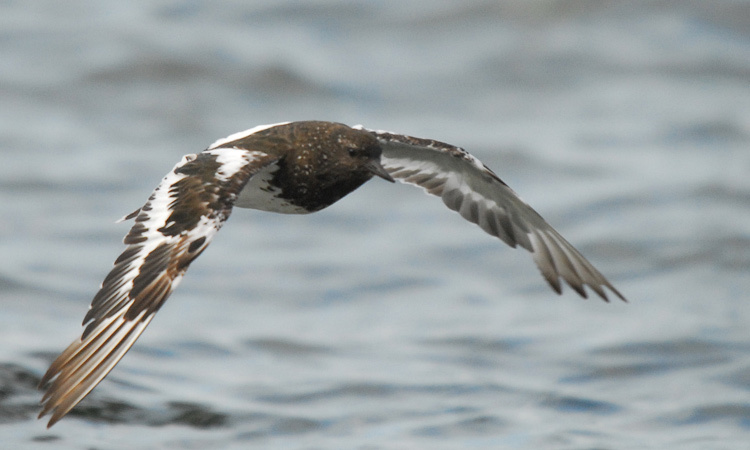 You can always count on Black Turnstones. They are here for the winter. But keep you eyes open. 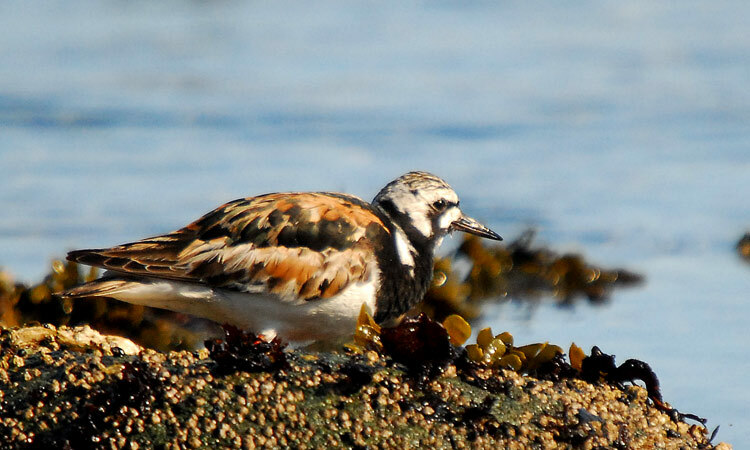 Occasionally a Ruddy Turnstone may show up. Like the Westerns, they like to forage and snooze at high tide. For all you aspiring photographers, thar's when you can get the close-ups. 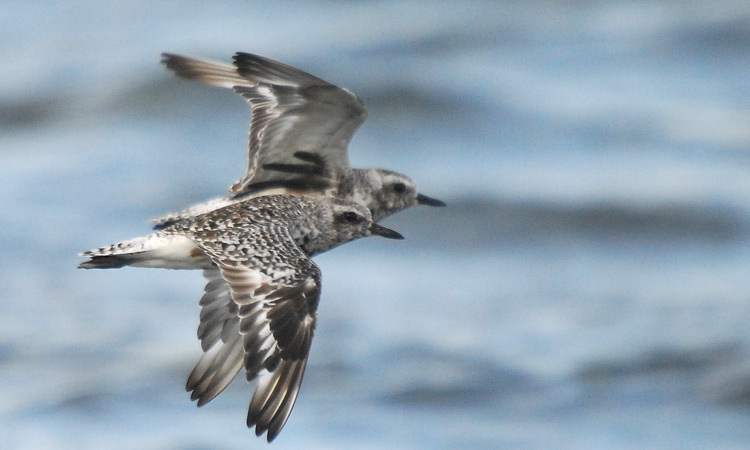 Another winter regular is the Black-bellied Plover. Actually, some of the non-breeders have been known to stay around all year. The Bonaparte's is a seasonal regular. 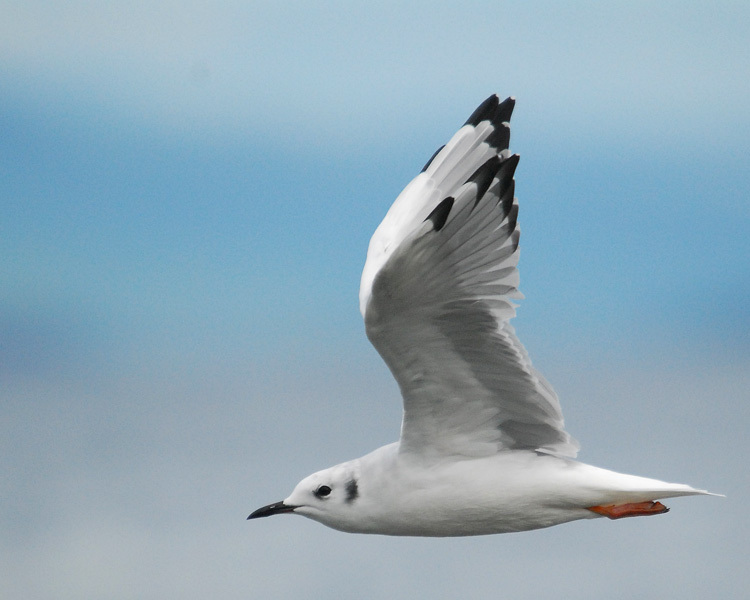 They arrive during the herring spawn in February and March before departing to their northern breeding grounds in late April and May. 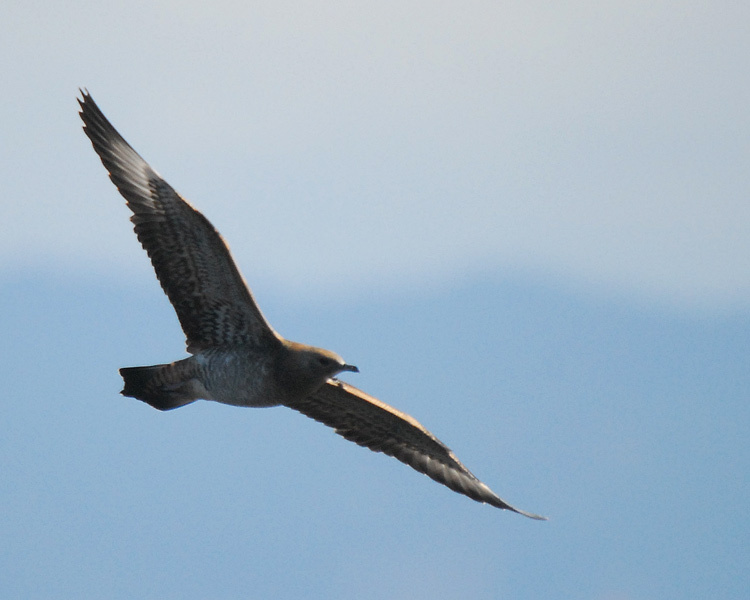 They return in July and hang around for the salmon spawn in October before heading south. 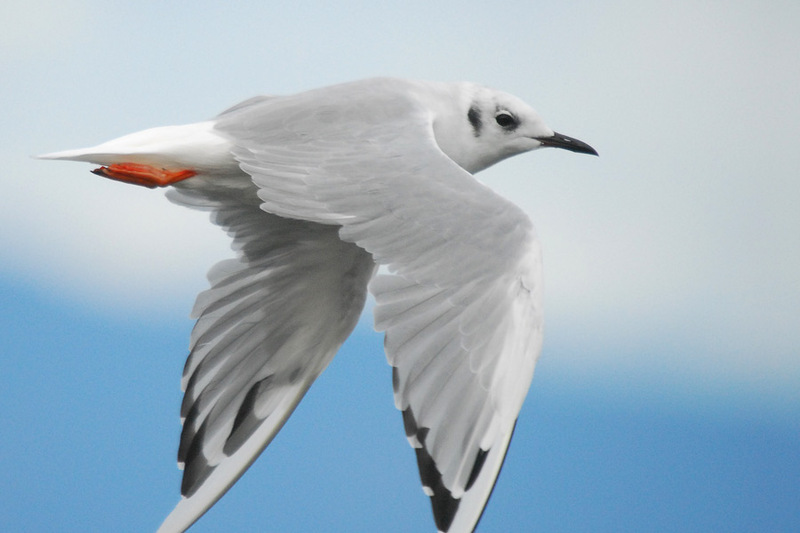 Admiral's is a great location for bonie photography as the bonies forage close to shore. 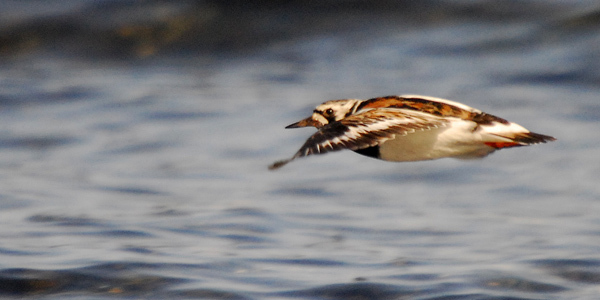 They also fly close to shore which is great for flight shots. Once again, high tide is the best time. Juvenile Bonies are characters. They think the world belongs to them as they defend their little piece of beach. Mistaken Identity - On Aug. 28 we stopped at Admiral's Lagoon to catch the high tide and any shorebird action. Unfortunately, the north wind was gusting and the waves were pounding the shoreline. There were only a few Bonies and Mallards feeding in the seaweed. As we enjoyed the windy solitude with no one else around, I explained to my wife that I had seen the Ruff here just over a year ago. 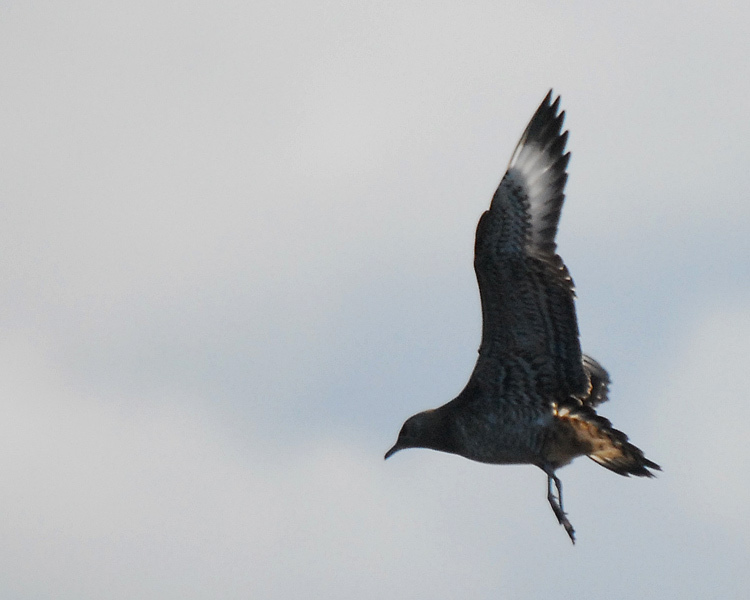 Just then a pair of shorebirds flew towards us. "Black-bellie Plovers," I shouted as the zoomed by, and I clicked the camera. Checking the playback screen, I was shocked and excited to see that the second bird wasn't a Black-bellied. 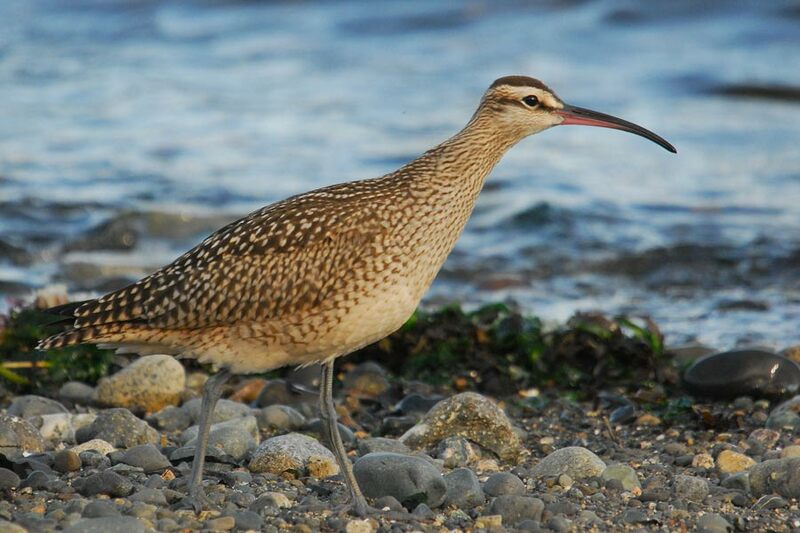 It was a large shorebird. The down-curved bill had Ruff written all over it. I couldn't wait to spread the word and posted my sighting as soon as I got home. The next day I saw the bird again from a distance. I remarked to John Purves that it looked too plump to be a Ruff, but we thought that it might have just been the position it was in. I also saw it later with Christopher Stevens, but it was in the direct sunlight and difficult to see any details. 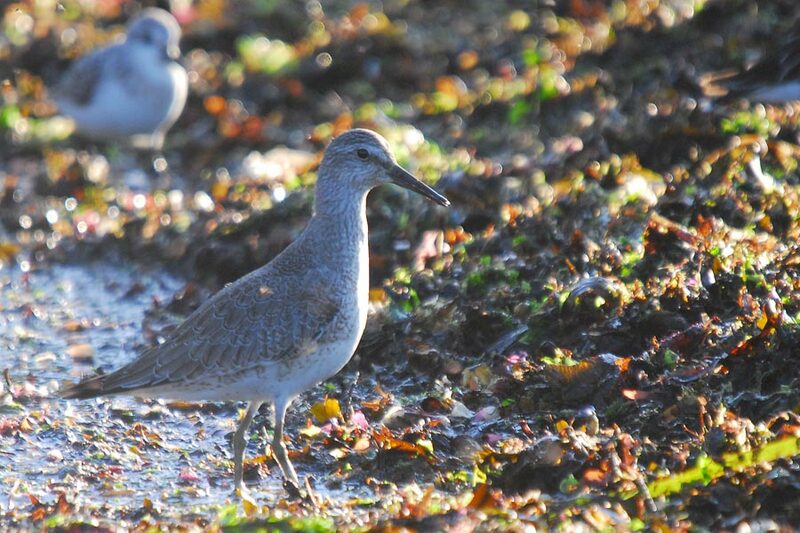 The next day Guy Monty checked for the Ruff and found a Red Knot instead. When I read his report, I quickly called up my photo and took a closer look. 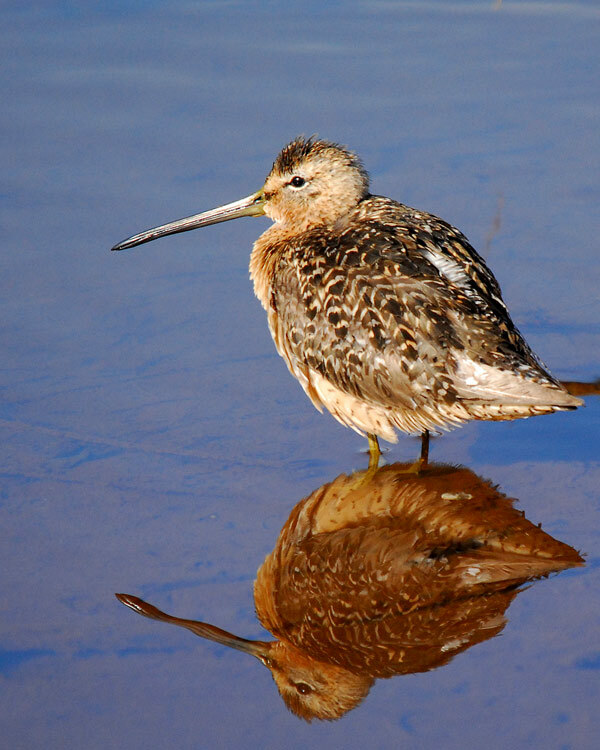 It had a white supercillium and black eyeline just like the Red Knot. The bill still looked curved but it could have been the angle that gave the illusion of curvature. I realized immediately that I had made a mistake. With egg on my face and a mouthful of humble pie, I quickly posted an apology and correction to the group. I had been seduced by my own expectations. I expected to see a Ruff and when I saw a shorebird of similar size and seemingly down-curved bill, I immediately concluded it was a Ruff without further analysis. 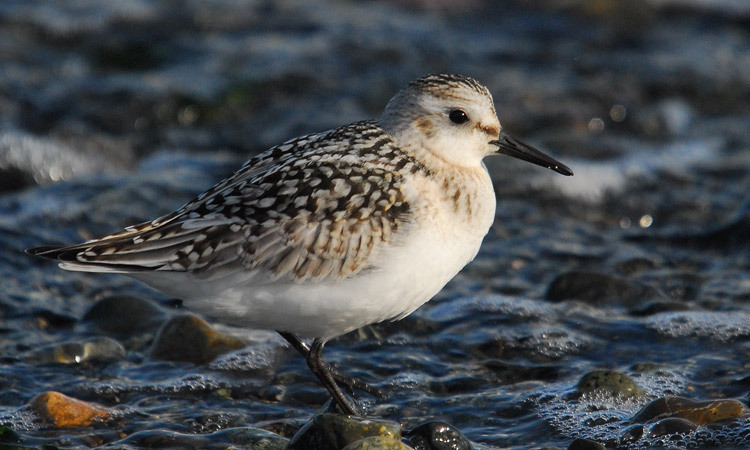 As well, it didn't help that I had never seen a Red Knot and never heard of one in this area. Although the Ruff turned out to be a Red Knot, it was not a disappointment to local birders as it was a lifer for many including myself. 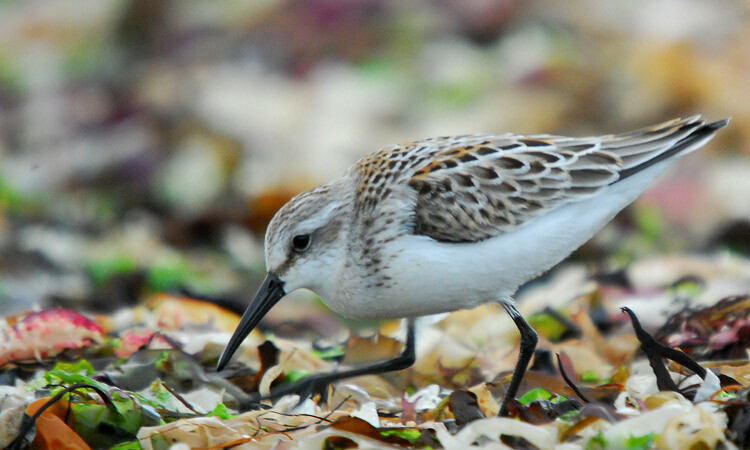 It's very considerate when the occasional Sanderling drops in for a visit. 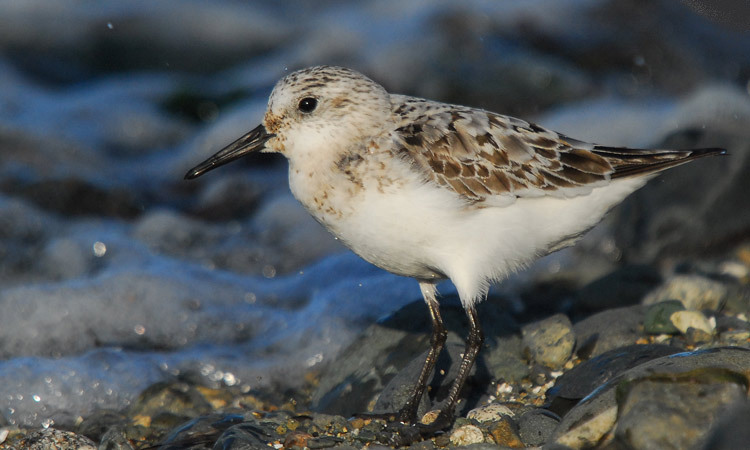 Only once have I seen a large flock of Sanderlings. That was many years ago when a flock of over 50 invaded French Creek Bay. Otherwise it's just one or two here and there. 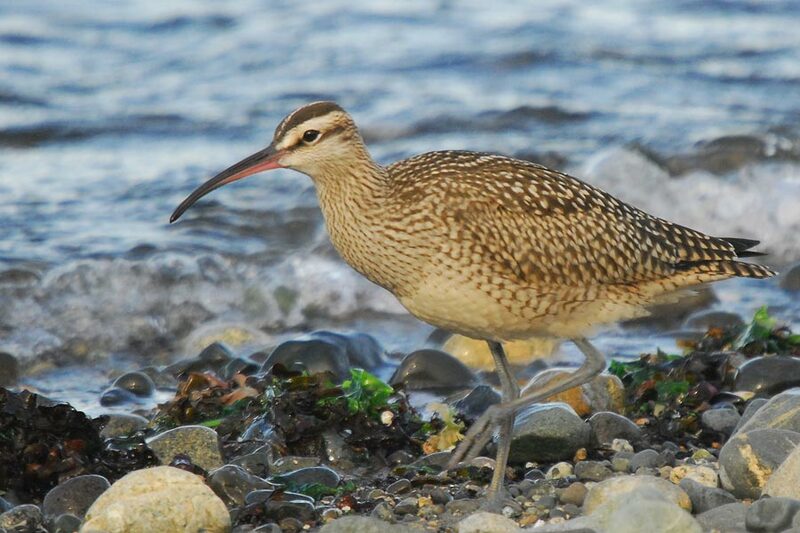 What a pleasant surprise to see 4 Whimbrels at French Creek. 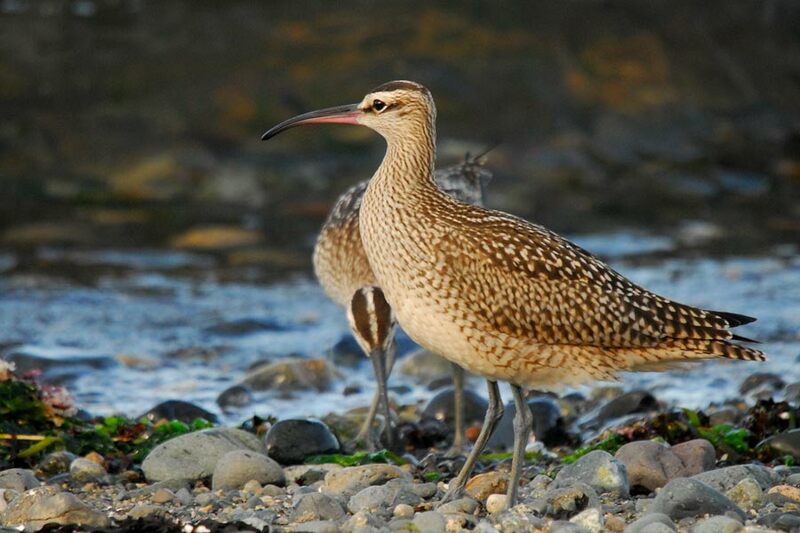 I've only ever seen one Whimbrel in the area and that was at San Malo. 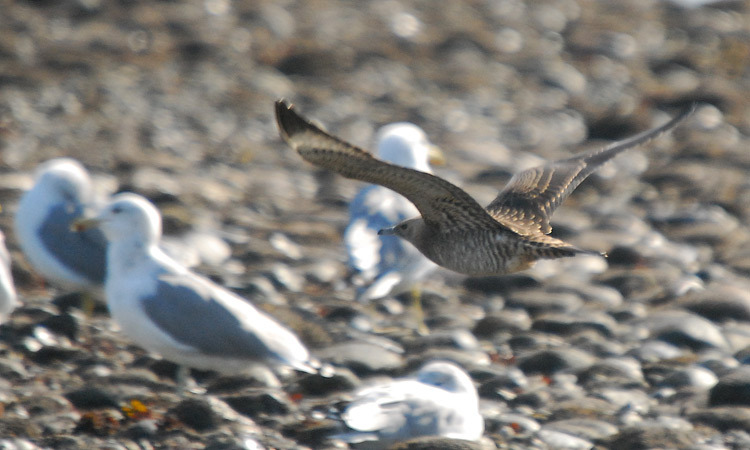 The Whimbrels were fraternizing with the gulls and shorebirds on the sandbar until a Parasitic Jaeger darted in to flush all the shorebirds. 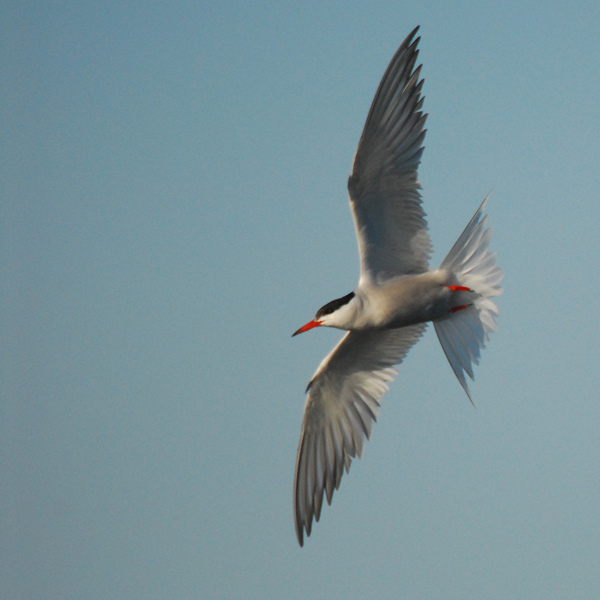 Common Terns are regular visitors at this time of year. 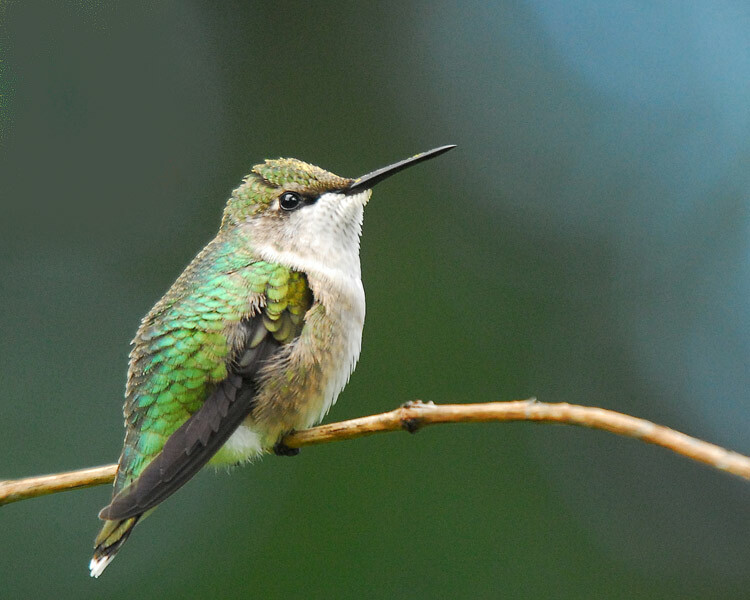 They are beautiful little birds. 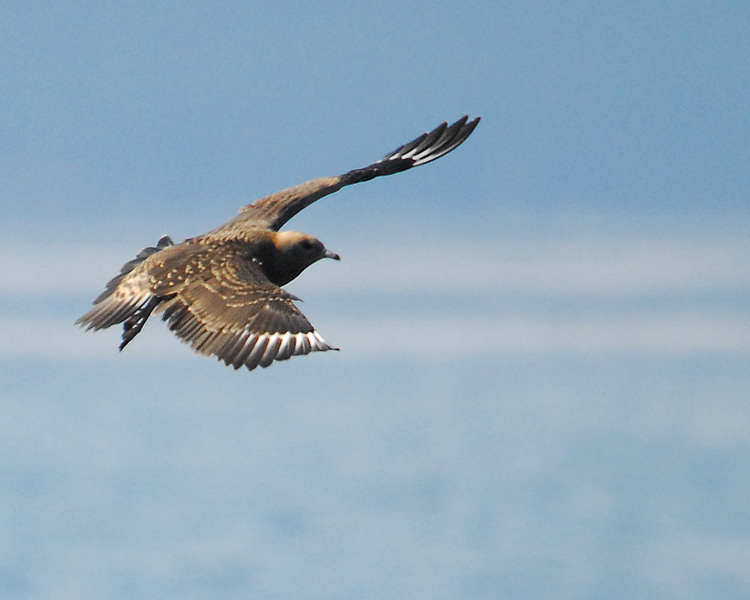 Sept. 1 - Deep Bay is usually the best place to see Parasitic Jaegers, but keep your eyes open at Admiral's. 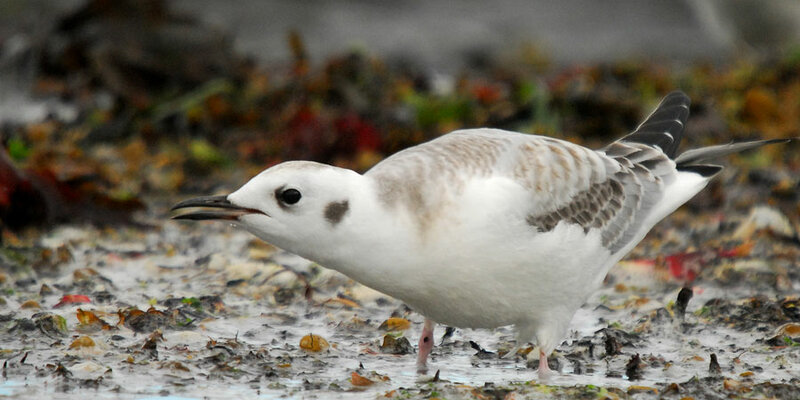 Today as I was looking for the Red Knot and Ruddy Turnstone, I spotted a Parasitic attacking the roosting gulls. The gulls didn't take it sitting down. They returned the favor and an aerial dogfight ensued. I think the Jaeger was just bored. 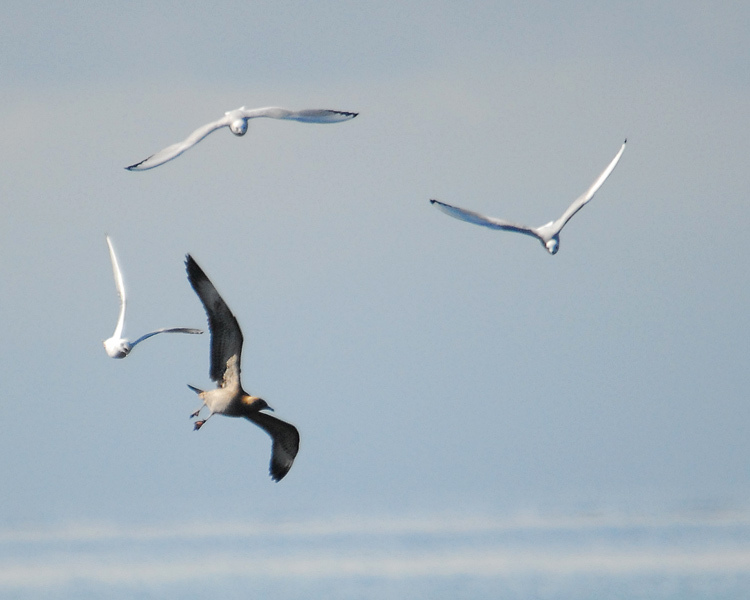 Since none of the gulls were foraging, it had nothing else to do. 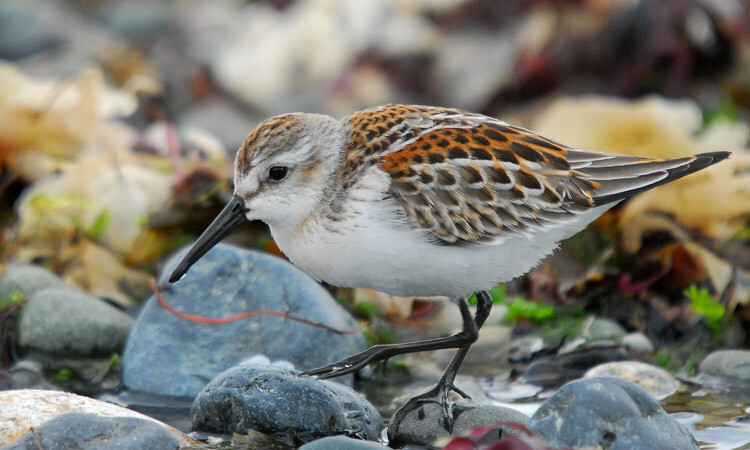 Sept. 1 - When I arrived at Admiral's there weren't many shorebirds around, but there was a familiar photographer. It was Ralph Hocken on one of his few days off. It's always good to see Ralph and compare notes on birding and photography. 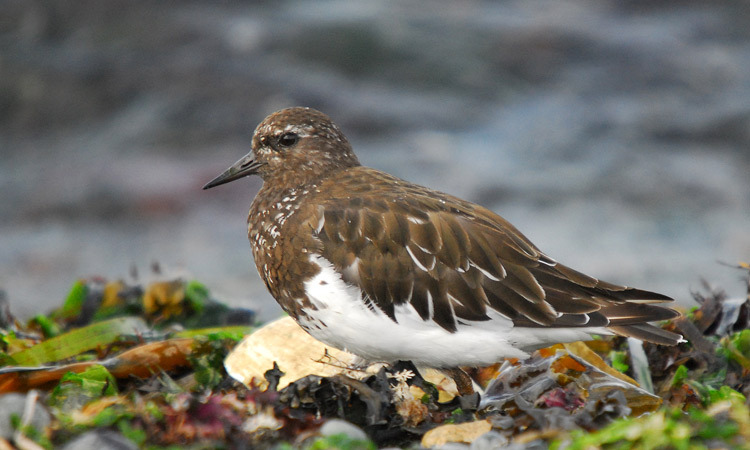 He hadn't seen the Knot but he did see a red-legged turnstone. 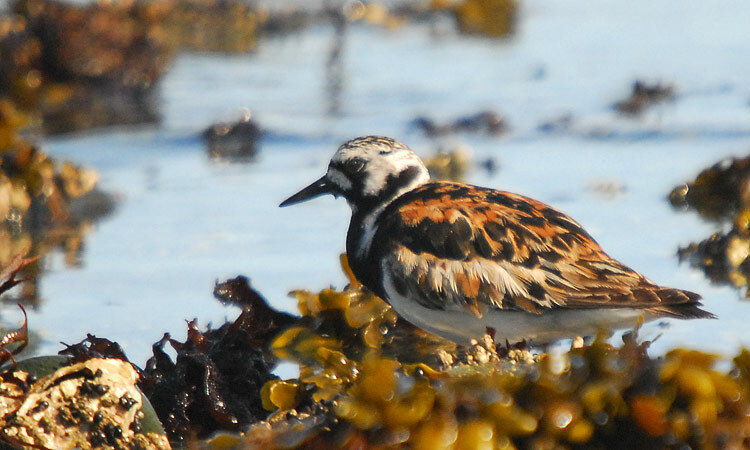 When he called up the photo on his playback screen, I knew immediately that it was a Ruddy Turnstone in breeding plumage. I decided not to disturb Ralph's photgraphy as he always does well in his own patient, quiet way. I headed for the west end of the beach off Eaglecrest. 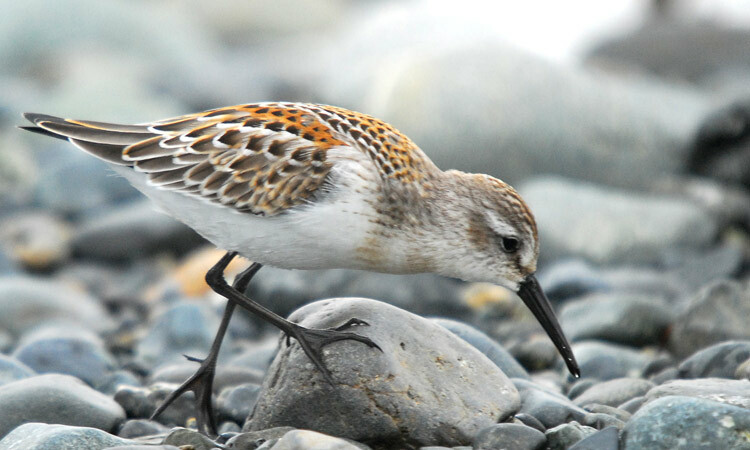 I scanned the many shorebirds along the rocky shoreline and was in luck. The Ruddy was there. Aug. 28 - Miracle Bird at Miracle Beach - Last week Martin Dollenkamp noticed a new hummingbird in his Miracle Beach backyard. 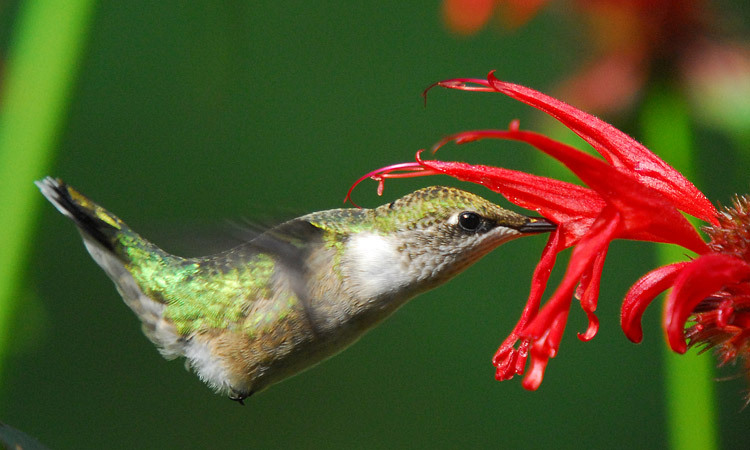 It was being harassed by his local Rufous hummers, but it managed to hold its own and settled into enjoying Martin's floral delights. 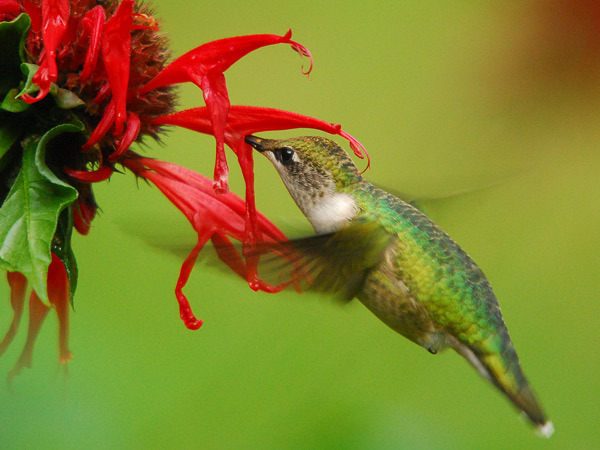 Being an expert photographer, it didn't take Martin long to post his definitive photos and receive positive confirmation that it was indeed an extremely rare Ruby-throated Hummer. The clincher was a tiny formative ruby-coloured gorget feather at the centre of its throat. Martin was very generous in sharing his backyard with me and any other bird enthusiasts, and the Ruby-throated was very compliant as it roosted and fed on the many flowers. 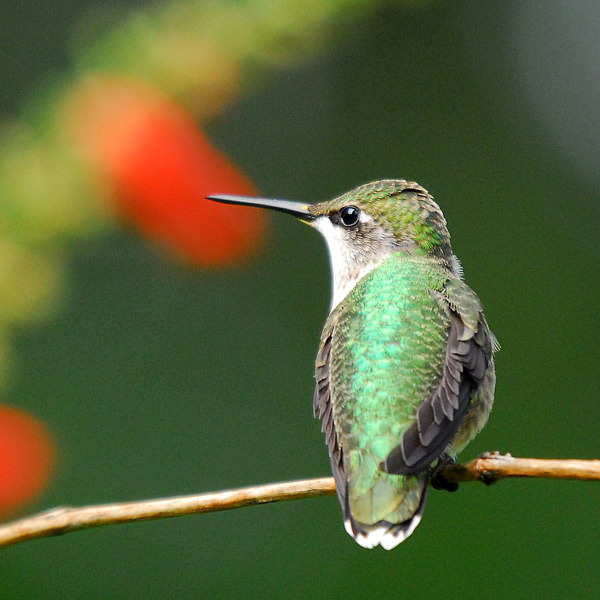 Just how rare is the Ruby-throated? 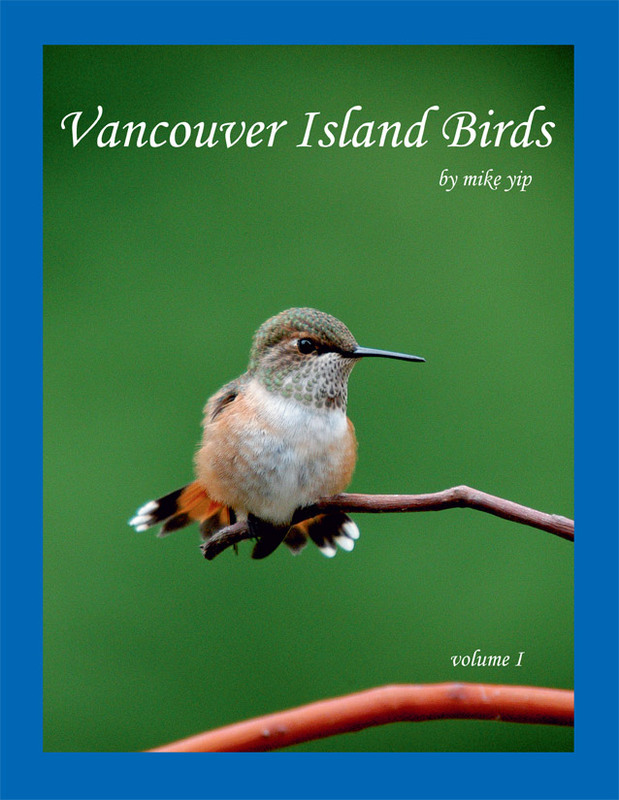 Martin's bird is believed to be only the second Ruby-throated on Vancouver Island. The previous one was reported in the spring of 1978 over 30 years ago. 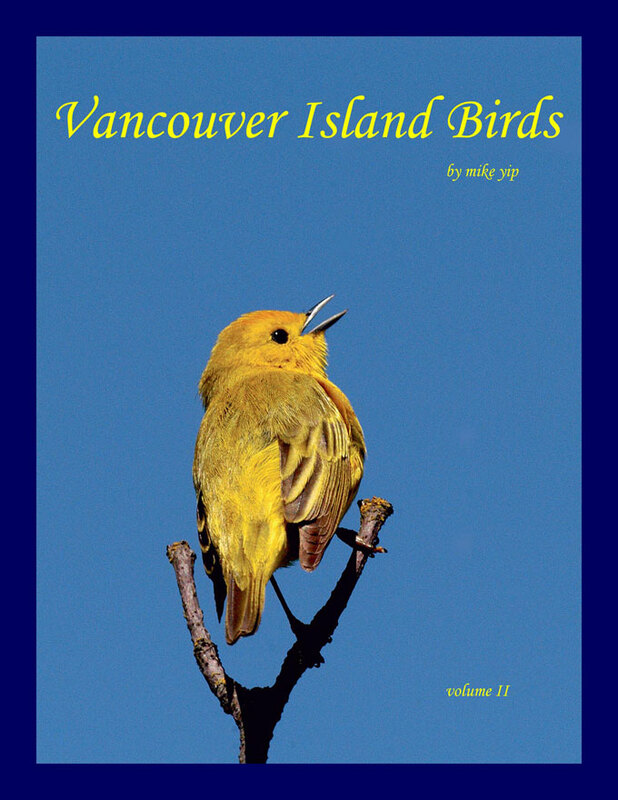 Coincidentally, it was also south of Campbell River. Thanks, for sharing the Ruby-throated, Martin.